moved from total obscurity to partial acceptance. And the same is true of Psychedelic art, Fanstastic Realism, Meta-Realism, etc which we are gathering here under the rubrique of Visionary Art. The states of mind offered by hallucinogens are many and varied. It is not simply a question of 'what images' may arise. 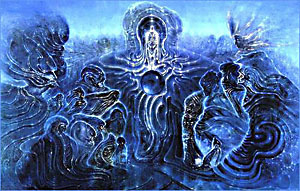 More difficult for the Visionary artist to convey are the many modalities of perception, the multiple states of mind, and the kinds of insights that can occur. Many of these have been documented and brought together under the heading of 'Transpersonal' Psychology - perhaps the third revolution in psychology, after Freud and Jung. A quick glimpse at the books lying around the studio of many third generation Visionaries will no doubt reveal atleast one or two titles by Ken Wilber or Stanislav Grof - the former a philosopher of the transpersonal, the latter its foremost psychologist. "In transpersonal experiences, as they occur in psychedelic sessions or in various non-drug frameworks... many experiences belonging to this category are interpreted by the subjects as regressions in historical time and explorations of their biological or spiritual past. It is not unusual in psychedelic sessions to experience quite concrete and realistic episodes identified as fetal and embryonic memories... On occasion, LSD subjects report experiences in which they identify with various animal ancestors in the evolutionary pedigree or have a distinct feeling of reliving episodes from their existence in a previous incarnation.